Clean and scale trout, only use the two fillets. Remove skin from fillets and roll into 4 cm diameter cylinders. Poach fish cylinders in the oven at 90 °C for 2 hours. Cut the fillets into rings 1cm x 1 cm and place into an emulsion of oil, yuzu and chili peppers. Put all ingredients except BASIC Textur in the Thermomix and purée into a fine cream. Salt at the end and add the BASIC Textur. Divide the pumpkin into halves and roast in the oven for about 1 hour at 180 °C. Remove the meat and add ginger and sugar. Salt and then make small ‘stones’ of approx. 5 g each and ‘shock frost’ them. Mix water, kaolin, lactose and dye in a bowl. Dip the frozen ‘stones’ into the mixture and dry in a 160 °C convection oven for 12 minutes. Clean sea bass and cut into 100 g pieces and keep cool. Mix olive oil, salt, lemon thyme and orange blossom water in a bowl. 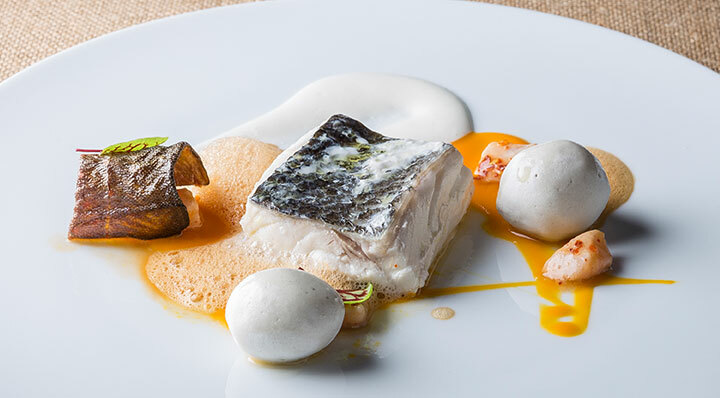 Vacuum the sea bass with the liquid and poach at 60 °C in the fusionchef sous vide water bath for 11 minutes. Simmer water, algae and rooibos in a pan at 70 °C for 30 minutes. Strain the infusion, add the soy lecithin and beat with a hand mixer. This recipe from the preliminaries of the “JUNGE WILDE 2016” was kindly made available to us by Alex Vidal.